Having spent the summer completing the Fantasia in F minor for piano duet (D940) and the Mass in E flat (D950), on 1 September 1828 the ailing Schubert moved to his brother’s apartments (‘Auf der Wieden’) in the Viennese suburbs in order to breathe the ‘better air’ of the surrounding countryside. However, the house had only recently been erected and the resulting dampness did little to improve the composer’s constant syphilitic fits of giddiness. As he had left most of his belongings and manuscripts with his close friend Schober, it is generally assumed that the composer had originally intended only a short stay, but in the event it was to become his last residence. Most of September was spent working on the last three piano sonatas (D958, D959, D960), and in early October Schubert contacted his publisher, Probst, announcing their imminent completion, alongside the String Quintet and some Heine and Rellstab song settings (later to become the song collection Schwanengesang). On 26 October, shortly before fatally contracting typhoid fever, Schubert signed the manuscripts of the Sonatas, and within the month (19 November) had passed away. Perhaps most poignantly of all, he had visited the music theorist Simon Sechter only two weeks before his death ‘in order to study counterpoint and fugue, because he understood that there he needed some assistance’. These final works appear not to have been written to order but rather because of some inner compulsion to set down his last thoughts before time ran out—he was only thirty-one years of age when he died. The only mention of the Quintet in his correspondence is found in a letter dated 2 October in which he mentions having ‘finally turned out’ the work before going on a walking tour with some friends; there is record neither in his friend Bauernfeld’s diaries nor in any contemporary musical literature. The original manuscript has since disappeared. Although Schubert’s immediate inspiration for the work is uncertain, it is known that during this time he took part (as violist) in a private performance of Beethoven’s late C sharp minor Quartet Op 131 which, according to an acquaintance, sent him ‘into such transports of delight and enthusiasm that all feared for him’. It is possible that he therefore felt some subconscious desire to emulate his composer-hero, who had himself died the previous year, by bowing out with a large-scale chamber music masterpiece. Interestingly, in composing his Quintet Schubert chose not to use the double viola ensemble favoured by Beethoven and perhaps most notably Mozart before him, but to add an extra cello to the normal string quartet configuration (two violins, viola, cello). This gave Schubert the benefit of an added bass instrument, allowing him greater freedom to explore the lyrical potential of the cello as well as providing him with potentially richer middle register textures, as in the Adagio where the main theme is played by the second violin, viola and first cello. To encompass the vast emotional range unleashed in this summation of a cruelly short creative life, Schubert expanded the time-scale of the Quintet to an unprecedented length—almost an hour when all the marked repeats are taken. Only ten days after Schubert’s death a vast quantity of his unpublished manuscripts were sold as a job lot to Diabelli & Co, and it verges on the unbelievable that the publication of one of the greatest of all chamber music compositions was delayed until 1853 (parts only) when it was designated ‘Op 163’. The first ever public performance (as far as this can be ascertained) was given as part of a string quartet recital on 17 November 1850 by an ensemble led by Georg Hellmesberger. Despite such inauspicious beginnings the String Quintet rapidly established itself, its heady combination of spacious lyricism and rigorous structural control exerting a profound influence. Many musicians have spoken in awe of its spiritual Elysianism, including the pianist Artur Rubinstein (who requested the slow movement be played at his funeral), the great nineteenth-century cellist Alfredo Piatti (who asked for it be played during his dying hours to send him into the next world), and the renowned quartet-leader John Saunders, who had the opening seven bars of the first movement’s second subject inscribed on his tombstone. The long-breathed opening bars of the Allegro ma non troppo create the impression of being a slow introduction, an ingenious device achieved by the use of long note values within a basically fast tempo (the opening C major chord consists of two tied semibreves). This temporal effect is further enhanced when the first violin dramatically launches into a series of staccato arpeggio figurations whose rate of harmonic change is identical to that of the opening, yet which at a surface level suggest a greater sense of imperativeness and forward momentum. A triplet figure first heard in this context soon dominates the proceedings, driving the music inexorably onwards towards a cadence which apparently resolves in the expected dominant for the second subject (G major). Yet by a miraculous harmonic sleight of hand Schubert moves us within two bars into the key of E flat as though it were the most natural thing in the world—an inspired preparation for one of the most cherished melodies in all music, a duet sounded first in the cellos, then the violins, and subsequently further ruminated upon by the first violin and viola. The exposition is rounded off by a new march-like idea which saturates in various forms the following development section. At this point the 154-bar exposition is repeated in its entirety. There is no first or second time bar—the closing dominant (G) seventh chord leads back quite naturally to the opening, yet when this point is reached for the second time, Schubert slips in another two-bar harmonic surprise to lift the music magically into A major. The extended and emotionally intensified development section culminates in the driving triplet rhythms first heard as a bridge between the first and second subjects and, following a radiantly seamless overlap with the return of the opening material, there ensues a recapitulation which retains the essential outlines of its exposition counterpart. The final coda acts as a secondary, microcosmic development section, closing with one final fond look back to the apparently innocent material which had initially spurred this magnificent creation into being. The String Quintet exemplifies Schubert’s love of the interval of the third, both in terms of localized harmonic movement and of long-term tonal relationships. The Adagio exemplifies this tendency, being cast in E major (a major third away from the work’s overall tonal centre) and opening with a meditative theme ostensibly in thirds (second violin and viola). The sense of timelessness unmistakably recalls the work’s opening bars, and the first violin’s decorative comments enliven textural interest in a way already familiar from the first movement’s second subject. This is music which superficially creates an impression of perfect calm and stillness, yet there is an underlying tension (due in no small part to the first violin’s pensive commentary) which finally erupts (signalled by an E unison trill) in the F minor middle section. Here the driving triplet rhythms encountered earlier in the work are transformed into malevolently sinister outbursts of dark foreboding as the music tears away as if in the throes of some tormented mental anguish constantly articulated by thrusting syncopated rhythms. The return to the opening material is accomplished with compelling mastery: the F minor section appears to exhaust itself before finally collapsing as the familiar strains re-emerge, this time with vastly more elaborate first violin and second cello lines decorating above and below. For all their apparent repose, the closing bars suggest a feeling of quiet resignation rather than resolution. Set immediately against the contemplative introspection of the slow movement, the rip-roaring peasant dance of a Scherzo which follows is all the more breathtaking in its primeval physical force. Indeed, in terms of its unquenchable propulsion and unbridled joy in hyperactive textures, this movement caps anything comparable in his entire output. Schubert’s elation is relatively short-lived, however, as a striking move up a semitone into D flat heralds the start of the central Andante sostenuto, whose tortured innocence painfully suggests the composer’s increasing awareness of his own mortality (he died just a matter of weeks after completing the Quintet). A short bridge passage, which would appear to have influenced the identical structural point in Schumann’s Piano Quintet, leads straight back to a repeat of the boisterous Scherzo. The enhanced physicality of the Scherzo spills over into the sonata-rondo Allegretto finale with its increased tendency towards muscular, pseudo-orchestral textures. There is some evidence to suggest that the opening C minor theme may have been derived from a Hungarian dance melody, although no one could mistake the typically Viennese lilt of the heart-warming second subject announced by the first violin and first cello. Just as in the first movement, Schubert’s delight in triplet figurations is well to the fore, first as an accompanying figure in the viola and then quickly transformed into dancing, decorative arabesques over the second violin’s extension of the theme. The final section finds Schubert at his most exuberant, driving the music home in an almost Tchaikovskian manner with a Più allegro propelling the final statement of the opening theme towards a breathtaking Più presto coda. Although the String Quintet is arguably Schubert’s finest chamber work, it hardly detracts from his other wide and varied achievements within the same sphere, including two full-scale piano trios, the celebrated Octet and ‘Trout’ Piano Quintet, some fifteen string quartets, and a substantial quantity of music for piano-accompanied instruments and piano duet. 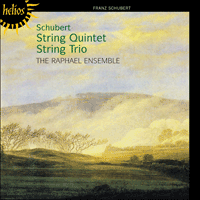 A number of otherwise notable works were left incomplete by Schubert (the most famous example being the ‘Unfinished’ Symphony), including the so-called ‘Quartettsatz’ in C minor, D703, and the work included on this recording, the String Trio in B flat, D471, of which only the first movement was completed (the first thirty-nine bars of a planned Andante sostenuto second movement have also survived). During the autumn of 1816, Schubert had finally quitted his much-loathed teaching post and moved in with his close friend Franz Schober. Away from his overcrowded and repressive family home, sharing accommodation with a charismatic young man whose experience of life was far wider than his own, and in a vastly improved frame of mind, Schubert began to pour forth new compositions, including the present String Trio during the September. Although compared to the vast musical canvas of the String Quintet, the Trio (as it exists) represents a veritable microcosm of musical activity, the tendency towards relatively untroubled, often highly lyrical exposition/recapitulations, dramatically heightened by a more serious central development section, is already unmistakable. This miniature gem is one of the most treasured works in the string repertoire. Après avoir passé l’été à faire les dernières retouches à la Fantaisie en fa mineur (D940) pour deux pianos et la Messe en mi bémol majeur (D950), Schubert, souffrant, s’installa le 1er septembre 1828 chez son frère, au «Auf der Wieden». Ce nouveau foyer, situé dans la banlieue de Vienne, lui donnait accès à «l’air plus pur» de la campagne environnante. Cependant, la construction de ce bâtiment venait tout juste d’être terminée, et l’humidité qui y régnait ne faisait qu’accroître les étourdissements du compositeur, qui souffrait de syphilis. Comme il avait laissé la plupart de ses manuscrits et effets personnels chez un de ses amis proches, Schober, on suppose généralement que le compositeur avait au début l’intention de ne séjourner que temporairement chez son frère, mais en fait ce nouvel appartement était destiné à devenir sa dernière demeure. Il occupa la plus grande partie du mois de septembre à la composition de ses trois dernières sonates pour piano (D958, D959, D960), et début octobre, entra en contact avec l’éditeur, Probst, pour annoncer qu’il terminerait bientôt ces œuvres, ainsi que le Quintette à cordes et quelques arrangements musicaux de chants de Heine et Rellstab (qui deviendraient plus tard la collection de chants Schwanengesang). Le 26 octobre, peu de temps après avoir contracté la fièvre typhoïde, Schubert apposa sa signature aux manuscrits des sonates, et mourut le 19 novembre, moins d’un mois plus tard. L’histoire la plus émouvante est peut-être sa visite au théoricien musical Simon Sechter, seulement deux semaines avant sa mort, «pour étudier le contrepoint et la fugue, car il avait réalisé qu’une aide extérieure lui serait grandement profitable dans ces domaines». Ces dernières œuvres ne semblent pas avoir été composées pour s’acquitter d’une commande, mais plutôt pour répondre à une impulsion à exprimer ses dernières pensées avant que le temps ne s’échappe—il n’était âgé que de trente et un ans lorsqu’il mourut. Seule une lettre datant du 2 octobre mentionne le Quintette, déclarant qu’il avait «finalement terminé» l’œuvre et qu’il projetait ensuite de faire une promenade avec des amis; ce fait n’est nullement mentionné dans le journal personnel de son ami Bauernfeld, ni dans aucun autre document musical contemporain. Le manuscrit original a depuis disparu. Même si l’inspiration immédiate de Schubert pour l’œuvre est incertaine, on sait qu’à l’époque il prit part à un concert privé en tant que violiste, interprétant le Quatuor en do dièse mineur op. 131 de Beethoven. Selon les dires de l’une de ses connaissances, cette interprétation le rendit «si enthousiaste et ravi que tout le monde craignait pour lui». Il est possible qu’à ce moment il eût ressenti un désir inconscient d’imiter son mentor en composition, qui avait quitté ce monde l’année précédente, laissant derrière lui un chef-d’œuvre grandiose pour musique de chambre. Il est intéressant de noter que lors de la composition de son Quintette à cordes, Schubert ne choisit pas d’utiliser deux violes comme l’aurait fait Beethoven, ou peut-être plus encore Mozart avant lui, mais décida d’ajouter un autre violoncelle au quatuor à cordes déjà existant (comprenant deux violons, un alto et un violoncelle). Cela fournit à Schubert la possibilité de bénéficier d’un instrument supplémentaire aux sons graves, qui lui offrirait un plus haut degré de liberté pour explorer son potentiel mélodique, ainsi que ses textures plus riches au milieu du registre, comme dans l’Adagio, où le thème principal est joué par le second violon, l’alto et le premier violoncelle. Comme pour embrasser la large gamme des émotions libérées au cours de sa brève carrière, la durée du Quintette est d’une longueur inhabituelle. Seulement dix jours après la mort de Schubert, une énorme quantité de manuscrits qui n’étaient pas encore publiés furent regroupés et vendus à Diabelli & Co, et il est absolument surprenant de constater que la date de publication de l’une de ses plus grandioses compositions pour musique de chambre fût retardée jusque 1853, et ne fût en fait publiée qu’en partie. Cette œuvre devint l’op. 163. On croit que sa première présentation en concert fut donnée lors d’un récital pour quatuor à cordes le 17 novembre 1850, par un ensemble dirigé par Georg Hellmesberger. Malgré un début aussi peu prometteur, le Quintette gagna rapidement en popularité grâce à l’influence profonde qu’exercèrent sa combinaison impétueuse de mélodies grandioses et un contrôle rigoureux de la structure. Plusieurs musiciens témoignent avec une profonde admiration de l’esprit élyséen de l’œuvre. Le pianiste Artur Rubinstein, par exemple, demanda que le mouvement lent fût joué lors de ses funérailles. L’éminent violoncelliste du XIXe siècle Alfredo Piatti, quant à lui, demanda que celui-ci fût joué pendant ses dernières heures pour l’accompagner dans son voyage vers l’autre monde, et le célèbre premier violon du quatuor, John Saunders, demanda que les sept premières mesures du second sujet dans le premier mouvement fussent inscrites sur sa pierre tombale. Les premières mesures de l’Allegro ma non troppo, dont la durée est plutôt longue, créent l’impression d’une introduction lente, résultat ingénieux obtenu par l’utilisation de grandes valeurs de notes dans un rythme assez rapide (l’accord du début en do majeur consiste en deux rondes liées). Cet effet temporel est accru par le premier violon, qui se lance dans une série dramatique d’arpèges staccato, dont la vitesse de changements harmoniques est identique à celle de l’ouverture, mais le niveau en surface suggère un caractère plus impérieux et un plus grand élan. Un passage en triolets, présenté pour la première fois dans ce contexte, devient la figure dominante, la musique étant inexorablement propulsée vers l’avant pour finalement arriver à une cadence qui semble se résoudre, comme on pourrait s’y attendre, dans la dominante du second sujet en sol majeur. Mais, par un léger changement harmonique, Schubert nous conduit en l’espace de deux mesures au ton de mi bémol, comme si c’était la chose la plus naturelle au monde, et le passage devient une préparation inspirée pour l’une des plus belles mélodies jamais entendues, un duo joué d’abord par les violoncelles, puis les violons, et finalement repris par le premier violon et l’alto. L’exposition se termine par un nouveau passage rappelant une marche, qui est repris plusieurs fois dans le développement sous différentes formes. A ce moment, la mesure 154 de l’exposition est répétée entièrement. Il n’y a pas d’indication de reprise—l’accord de septième de dominante en sol qui termine le passage revient de façon naturelle à l’ouverture, et lorsque ce moment est répété une seconde fois, Schubert introduit une nouvelle surprise, et en l’espace de deux mesures transpose la musique comme par magie dans le ton de la majeur. Le développement, plus long et d’émotions plus intenses, atteint son apogée dans les rythmes rapides en triolets, qui ont été entendus pour la première fois dans le pont reliant le premier et le second sujets. Une récapitulation, suivant un retour radieux du matériau de l’ouverture, retient les contours essentiels de la contrepartie de l’exposition. La coda finale tient le rôle d’un développement secondaire microscopique, jetant à la fin un dernier regard vers le matériau apparemment innocent qui avait initialement donné vie à cette merveilleuse création. Le Quintette à cordes est un exemple de l’amour de Schubert pour l’intervalle de tierce, autant dans son mouvement harmonique localisé que dans ses relations tonales à long terme. L’Adagio en mi majeur possède aussi cette tendance (une tierce majeure plus éloignée que le centre de la tonalité générale de l’œuvre) et débute par un thème méditatif en tierces (second violon et alto). Le sentiment d’intemporalité rappelle sans hésitation les premières mesures de l’œuvre, et les commentaires décoratifs du premier violon enjolivent les textures musicales qui, ayant été présentées dans le second sujet du premier mouvement, nous sont déjà familières. Cette musique crée de façon superficielle une impression de calme et d’immobilité parfaits, mais on peut ressentir une tension sous-jacente (due en grande partie au commentaire pensif du premier violon) dont un trille à l’unisson sur mi signale l’explosion dans le ton de fa mineur de la section centrale. Les rythmes en triplets trouvés auparavant sont transformés en de sinistres éruptions malveillantes de sombres pressentiments, alors que la musique se sépare, tourmentée par une anxiété constamment articulée par l’assaut des rythmes syncopés. Le retour au matériau de l’ouverture est accompli avec une grande maîtrise, alors que la section en fa mineur semble s’épuiser elle-même avant de s’effondrer, alors que les tendances familières émergent une nouvelle fois, mais avec un premier violon beaucoup plus élaboré, entouré par les phrases ornées du violoncelle. Les dernières mesures, dans leur calme apparent, suggèrent plus un sentiment de résignation que de résolution. La force physique primitive de la danse paysanne animée du Scherzo qui suit, lorsqu’elle est comparée à l’introspection contemplative du mouvement lent, devient encore plus surprenante. En fait, l’élan assoiffé et la joie sans retenue des textures animées font de ce mouvement une œuvre qui surpasse tout ce qui est comparable dans son répertoire. L’exaltation de Schubert n’est cependant que de courte durée, alors qu’un mouvement ascendant d’un demi-ton en ré bémol annonce le début de l’Andante centrale sostenuto, dont l’innocence torturée suggère avec douleur que le compositeur était de plus en plus conscient de sa propre mortalité (Schubert mourut deux semaines seulement après la composition du Quintette). Un pont court, qui semble avoir influencé la structure identique du Quintette pour piano de Schumann, conduit directement au retour sonore du Scherzo. Le physicalisme accru du Scherzo est aussi présent dans la sonata-rondo Allegretto finale, qui tend de plus en plus vers des textures puissantes et faussement orchestrales. Certaines évidences suggèrent que le thème d’ouverture en do mineur fut peut-être inspiré d’une mélodie de danse hongroise, mais on peut facilement reconnaître le chant joyeux viennois dans le chaleureux second sujet annoncé par le premier violon et le premier violoncelle. Tout comme dans le premier mouvement, Schubert emploie en abondance des passages en triolets, tout d’abord dans l’accompagnement de l’alto, et ensuite en arabesques ornées et dansantes au-dessus de l’extension du thème interprété par le second violon. La section finale est la plus exubérante, la musique revenant alors à son point de départ d’une manière presque «à la Tchaikovski», avec un Più allegro élançant le dernier énoncé du thème de l’ouverture vers une merveilleuse coda Più presto. Même si ce Quintette à cordes est, de façon discutable, la meilleure œuvre pour musique de chambre de Schubert, il ne diffère pas beaucoup des autres œuvres de ce grand répertoire varié, qui comprend deux Trios grandioses pour piano, l’Octuor pour instruments à vent et le Quintette pour piano «La Truite», tous deux célèbres, une quinzaine de Quatuors à cordes, et une énorme quantité de musique pour instruments accompagnés d’un piano, et d’autres œuvres pour deux pianos. La composition d’un nombre d’œuvres importantes ne fut pas terminée (l’exemple le plus célèbre étant la Symphonie «Inachevée»), parmi lesquelles le soi-disant «Quartettsatz» en do mineur, D703, et l’œuvre choisie pour terminer ce programme, le Trio à cordes en si bémol, D471, dont seulement le premier mouvement fut achevé (les premières trente-neuf mesures de l’Andante sostenuto ainsi que le second mouvement ont aussi survécu). Pendant l’automne 1816, Schubert quitta finalement son poste d’enseignant, qu’il détestait, et emménagea chez un ami proche, Franz Schober. Loin de la maison familiale, bondée et oppressive, et vivant avec un jeune homme charismatique dont le vécu dépassait de beaucoup le sien, l’état d’esprit de Schubert s’en trouva vivifié, ce qui lui permit de se remettre à la composition de nouvelles œuvres, entre autre le présent Trio à cordes datant du mois de septembre. Même si on compare cette œuvre, comme elle se présente actuellement, au grand canevas musical du Quintette à cordes, elle représente un véritable microcosme d’activité musicale, son exposition et ses récapitulations étant relativement calmes et très mélodiques. Cette tendance déjà présente est accentuée de façon intense par la section centrale plus sérieuse du développement. Ce bijou miniature est l’un des trésors artistiques les plus précieux du répertoire pour cordes. Sa musique vit maintement avec une jeunesse prodigieuse. Nachdem er den Sommer mit der Fertigstellung der Fantasie in f-Moll für Klavier zu vier Händen und der Messe in Es-Dur verbracht hatte, zog der kränkelnde Schubert am 1. September 1828 in die in einem Wiener Vorort („Auf der Wieden“) gelegene Wohnung seines Bruders, um dort die „bessere Luft“ der umliegenden ländlichen Gegend zu atmen. Das Haus war jedoch erst kurz zuvor erbaut worden und war demzufolge feucht, und dies schuf den fortwährenden syphilitischen Schwindelanfällen des Komponisten wenig Abhilfe. Da er den größten Teil seiner Besitztümer und Manuskripte bei Schober (einem nahen Freund) gelassen hatte, wird allgemein angenommen, daß der Komponist ursprünglich nur einen kurzen Aufenthalt beabsichtigte, aber es sollte dann doch sein letztes Domizil sein. Der größte Teil des Septembers verging mit Arbeit an den letzten drei Klaviersonaten (D958, D959, D960), und im frühen Oktober nahm Schubert Kontakt mit seinem Verleger Probst auf und kündigte ihre unmittelbare Fertigstellung an, sowie die des Streichquintetts und einiger Vertonungen von Gedichten Heines und Rellstabs (die später als Liedersammlung Schwanengesang bekannt wurden). Schubert unterschrieb am 26. Oktober, kurz bevor er tödlich an Typhus erkrankte, die Manuskripte der Sonaten und verstarb weniger als einen Monat später (am 19. November). Am ergreifendsten ist vielleicht, daß er nur zwei Wochen vor seinem Tode den Musiktheoretiker Simon Sechter aufgesucht hatte, „um Kontrapunkt und Fuge zu studieren, da er meinte, daß er auf diesem Gebiete Hilfe benötigte“. Es scheint, als habe Schubert diese letzten Werke nicht auf Bestellung geschrieben, sondern aus einem inneren Zwang, seine letzten Gedanken zu Papier zu bringen, bevor seine Zeit zu Ende ging—als er starb, war er erst einunddreißig Jahre alt. In seinem Briefwechsel ist das Quintett lediglich in einem Brief mit dem Datum des 2. Oktober zu finden, indem er erwähnt, daß er das Werk endlich „hervorgebracht“ habe, bevor er sich mit ein paar Freunden auf eine Wanderung begab; weder in den Tagebüchern seines Freundes Bauernfeld noch in irgendeinem Exemplar zeitgenössicher Musikliteratur findet sich ein Hinweis. Das Originalmanuskript ist seitdem verlorengegangen. Obwohl Schuberts unmittelbare Inspiration für das Werk ungewiß ist, weiß man, daß er zu dieser Zeit (als Geiger) an einer privaten Aufführung von Beethovens spätem Quartett op. 131 in cis-Moll teilnahm, die ihn, laut eines Bekannten, „in solch freudiges Entzücken und solche Begeisterung versetzte, daß alle um ihn bangten“. Möglicherweise spürte er, da er sich mit einem großangelegten Meisterwerk der Kammermusik verabschiedete, eine unterbewußten Sehnsucht, es diesem von ihm verehrten Komponisten, der ein Jahr zuvor verstorben war, gleichzutun. Interessanterweise entschied sich Schubert bei der Komposition seines Quintetts nicht dazu, wie Beethoven—und vor ihm hauptsächlich Mozart—ein doppeltes Bratschenensemble zu benutzen, sondern zur normalen Streichquartettbesetzung (zwei Geigen, Bratsche, Violoncello) ein weiteres Cello hinzuzufügen. Dies verschaffte Schubert den Vorteil eines zusätzlichen Baßinstruments, das ihm größere Freiheit zur Erkundung der vom Cello besessenen lyrischen Ausdrucksmöglichkeiten verlieh, und ihm darüberhinaus eine potentiell reichere Struktur im mittleren Register verschaffte, wie z. B. im Adagio, in dem das Hauptthema von der zweiten Geige, der Bratsche und dem ersten Cello gespielt wird. Zur Erfassung der gewaltigen Gefühlsskala, die in diesem Gipfel eines grausam kurzen schöpferischen Lebens zutage tritt, dehnte Schubert die Zeitspanne des Quintetts zu noch nie dagewesener Länge aus. Nur zehn Tage nach Schuberts Tod wurde eine riesige Menge seiner unveröffentlichten Manuskripte als Warenposten an Diabelli & Co verkauft, und es ist kaum zu glauben, daß der (teilweise) Druck einer der größten aller Kammermusikkompositionen bis 1853 verzögert wurde, als sie unter dem Titel „op. 163“ erschien. Der (soweit feststellbar) allererste öffentliche Vortrag fand am 17. November 1850 statt, als Teil eines von einem Ensemble unter Leitung von Georg Hellmesberger gegebenen Vorspiels von Streichquartetten. Trotz dieses unheilverheißenden Anfangs etablierte sich das Streichquartett sehr schnell. Seine berauschende Kombination von weitschweifiger Lyrik und strenger struktureller Kontrolle übten einen starken Einfluß aus. Viele Musiker haben seine himmlische Entrückung mit ehrfurchtsvollen Worten beschrieben, so z. B. der Pianist Artur Rubinstein, der den Wunsch äußerte, daß der langsame Satz bei seinem Begräbnis gespielt werden solle, Alfredo Piatti, der große Cellist des neunzehnten Jahrhunderts, der bat, daß es in seiner Sterbestunde gespielt werde, um ihn ins Jenseits zu geleiten, und der berühmte Quartettleiter John Saunders, der die ersten sieben Takte des zweiten Themas aus dem ersten Satz auf seinen Grabstein meißeln ließ. Die langgezogenen Eröffnungstakte des Allegro ma non troppo erzeugen den Eindruck einer langsamen Einleitung. Dies ist ein genialer Kunstgriff, der durch den Gebrauch langer Notenwerte innerhalb eines grundsätzlich schnellen Tempos wirkt (der einleitende C-Dur-Akkord besteht aus zwei gebundenen ganzen Noten). Dieser zeitliche Effekt wird weiter gesteigert, wenn die zweite Violine sich auf dramatische Weise in eine Reihe von staccato arpeggio gespielten Figurierungen wirft, in der zwar ebensoviele harmonische Wechsel wie in der Eröffnung stattfinden, die jedoch oberflächlich herrischer und vorwärtsdrängender klingt. Eine zuerst in diesem Zusammenhang erscheinende Triolenfigur spielt bald eine vorherrschende Rolle. Sie treibt die Musik unerbittlich zu einer Kadenz, welche sich anscheinend in die erwartete Dominante für das zweite Thema (G-Dur) auflöst. Doch bewegt uns Schubert dann durch wunderbare Kunstfertigkeit innerhalb von zwei Takten zur Tonart Es-Dur, als ob dies die natürlichste Sache der Welt sei. Die ist eine geniale Vorbereitung auf eine der meistgeliebten Melodien in der gesamten Musik, ein erst in den Celli, dann in den Violinen erklingendes Duett, das dann von der ersten Violine und der Viola weiter ausgearbeitet wird. Die Exposition wird durch ein neues marschartiges Motiv zu ihrem Abschluß gebracht, und dieses Motiv durchdringt in verschiedenen Erscheinungsformen die dann folgende Entwicklung. An dieser Stelle wird die 154-taktige Expositon vollständig wiederholt. Es gibt keinen die erste oder zweite Wiederholung ankündigenden Taktstrich—der abschließende Dominantseptakkord (G) führt auf ganz natürliche Weise zum Beginn zurück, doch als dieser Punkt zum zweiten Mal erreicht wird, läßt Schubert eine weitere zweitaktige harmonische Überraschung einfließen, mit der die Musik auf wunderbare Weise zu A-Dur emporgehoben wird. Der ausgedehnte und emotionell intensivere Entwicklungsteil erreicht seinen Höhepunkt in den kraftvollen Triolenrhythmen, die erst als Überleitung vom ersten zum zweiten Thema gehört werden, und dann folgt auf eine brillant nahtlose Überschneidung mit der Wiederkehr des anfänglichen Stoffes eine Reprise, welche die grundlegenden Umrisse ihres in der Exposition befindlichen Gegenstücks beibehält. Die Koda zum Schluß hat die Funktion einer sekundären, mikroskopischen Entwicklung, die sich mit einem letzten liebevollen Blick zu dem augenscheinlich unschuldigen Stoff zurückwendet, dem diese großartige musikalische Schöpfung ursprünglich ihre Entstehung verdankte. Das Streichquintett ist ein gutes Beispiel für Schuberts Vorliebe für das Intervall der Terz, sowohl im Hinblick auf örtliche harmonische Bewegung als auch auf längere tonale Beziehungen. Das in E-Dur (also eine große Terz vom tonalen Mittelpunkt des gesamten Werkes entfernt) abgefaßte und mit einem beschaulichen, (von der zweiten Violine und der Viola gespielten) vorgeblich aus Terzen bestehenden Thema beginnende Adagio ist typisch für diese Tendenz. Der Eindruck von Zeitlosigkeit läßt die Anfangstakte der Werkes unverkennbar wieder erstehen, und die von der ersten Violine beigetragenen Verzierungen beleben das strukturelle Interesse in einer Art, die uns bereits aus dem zweiten Thema des ersten Satzes vertraut ist. Dies ist Musik, die einen oberflächlichen Eindruck vollkommener Ruhe und tiefen Friedens erzeugt, und die doch eine unterschwellige (großenteils durch den nachdenklichen Kommentar der ersten Geige hervorgebrachte) Spannung enthält, welche schließlich (durch einen einstimmigen Triller in E signalisiert) im Mittelteil in f-Moll zum Vorschein kommt. Hier werden die schwungvollen Triolen, die uns an früheren Stellen des Werkes begegneten zu bösartig finsteren Ausbrüchen schlimmer Vorahnungen umgeformt, und dabei rast die Musik davon, als befinde sie sich in den Wehen einer qualvollen geistigen Pein, die fortwährend durch energische synkopierte Rhythmen ausgedrückt wird. Die Rückkehr zum Stoff der Exposition wird auf faszinierend kunstvolle Weise vollzogen; der Abschnitt in f-Moll scheint sich selbst zu erschöpfen, und bricht dann schließlich zusammen, als die bekannten Töne von neuem erklingen—diesmal mit komplizierteren, von der ersten Geige und vom zweiten Cello gespielten Melodieführungen, die die oberen und unteren Stimmen ausschmücken. Trotz ihrer augenscheinlichen Entspannung rufen die Schlußtakte eher ein Gefühl stiller Resignation als einen Eindruck von Bestimmtheit hervor. Das dann folgende Scherzo in Form eines überschwenglichen Bauerntanzes ist in seiner körperlichen Urkraft umso atemberaubender, als es in unmittelbarem Kontrast zum besinnlichen, nach innen gekehrten langsamen Satz steht. In der Tat überbietet dieser Satz kraft seines unaufhaltsamen Vorwärtsdrängens und seiner ungezügelten Freude an überaktiven Strukturen alles Vergleichbare in Schuberts gesamtem Schaffen. Die Hochstimmung des Komponisten ist jedoch ziemlich kurzlebig: eine dann folgende, einen Halbton höher nach Des strebende Bewegung kündigt den Beginn eines zentralen Andante sostenuto an, dessen gequälte Unschuld auf schmerzliche Weise andeutet, daß der Komponist sich zunehmend seiner eigenen Sterblichkeit bewußt wurde (Schubert starb etwas über zwei Wochen nach Fertigstellung des Quintetts). Ein kurzer überleitender Abschnitt, der die identische Stelle in Schumanns Klavierquintett sehr gut beeinflußt haben mag, führt geradewegs zurück zu einer Wiederholung des ausgelassenen Scherzos. Die gesteigerte Körperlichkeit des Scherzos strömt dann in einen Allegretto-Schlußteil in Form eines Sonatenrondos über, der eine noch ausgeprägtere Neigung zu kraftvollen, fast orchestral wirkenden Strukturen zeigt. Es gibt ein paar Anhaltspunkte dafür, daß das einleitende Thema in c-Moll aus einer ungarischen Tanzmelodie abgeleitet wurde, doch klingt der muntere Rhythmus des herzerfreuenden, von der ersten Geige und dem ersten Cello angekündigten zweiten Themas unleugbar typisch wienerisch. Genau wie im ersten Satz ist auch hier Schuberts Vorliebe für Triolen-Figurierungen stark fühlbar. Sie zeigt sich zum einen als von der Viola gespielte Begleitfigur und wird dann rasch in tänzelnde, dekorative Arabesken über der von der zweiten Geige gespielten Weiterführung des Themas umgewandelt. Der Schlußabschnitt zeigt die überschäumendsten Charakterzüge des Komponisten. Er drängt hier die Musik auf fast an Tschaikowsky gemahnende Weise zu ihrem Abschluß und läßt ein Più allegro den letzten Eintritt des Eröffnungsthemas bis zu einer atemberaubenden, Più presto gespielten Koda vorantreiben. Das Streichquintett dürfte wohl Schuberts kunstvollstes Stück Kammermusik sein, doch tut es seinen weiteren umfangreichen und vielfältigen Leistungen auf demselben Gebiet kaum Abbruch. Zu diesen gehören zwei großangelegte Klaviertrios, das berühmte Wiener Oktett und das Klavier-„Forellen“-Quintett, ungefähr fünfzehn Streichquartette und eine bedeutende Anzahl ansonsten bemerkenswerter Werke. die von Schubert unvollendet gelassen wurden (das berühmteste Beispiel ist die „Unvollendete“ Sinfonie), zu denen der sogenannte „Quartettsatz“ in c-Moll D703 gehört, sowie das zum Abschluß dieses besonderen Programms gewählte Streichtrio in B-Dur D471, von dem lediglich der erste Satz vollendet wurde (und von dem auch die ersten neununddreißig Takte eines geplanten, Andante sostenuto betitelten zweiten Satzes erhaltengeblieben sind). Im Herbst 1816 hatte Schubert endlich die von ihm so gehaßte Stelle als Schulmeister aufgegeben und war ins Haus seines nahen Freundes Franz Schober gezogen. Jetzt, da er den überfüllten und repressiven Familienwohnsitz verlassen hatte und ein Quartier mit einem charismatischen jungen Mann teilte, der ihm viel an Lebenserfahrung voraus hatte, begann Schubert, in einer weitaus besseren Geistesverfassung neue Kompositionen förmlich auszuschütten, so zum Beispiel im September das vorliegende Streichtrio. Obwohl das Trio (in seiner jetzigen Form) im Vergleich zum riesigen musikalischen Gemälde des Streichquartetts einen wahren Mikrokosmos musikalischer Aktivität darstellt, so ist doch seine Neigung zu ziemlich unbekümmerten, oft hochlyrischen Expositionen und Reprisen, die durch den ernsteren Mittelteil der Entwicklung hervorgehoben werden, bereits unüberhörbar. Dieses miniaturenhafte Juwel ist eines der am höchsten geschätzten Werke im Repertoire für Streichinstrumente. Lebt seine Musik jetzt voll gewaltiger Jugend.